The season of the Festa Major is going on in the Catalonian capital and we thought we could present you the Castellers, a tradition in the region. 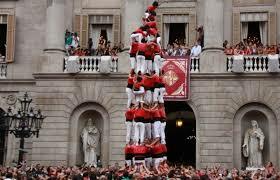 “Castells” in Catalonian means castles, the Castellers are then people building a tower, more precisely a human tower. You can see these impressive shows during the Festa Major de Gracia. Stay in our familial aparthotel in Gracia. This discipline started at the end of the 18th, in a small town near Tarragona, Catalonia. You can actually see the oldest castellers group in Tarragona. Over the years, this tradition spreads all over Catalonia and you can nowadays enjoy the show even in Barcelona, where the castellers group is the 4th oldest of the region. Castells were acknowledged as Immaterial Cultural Heritage by Unesco in 2010. You will have different levels of castells, the record being 10 levels. 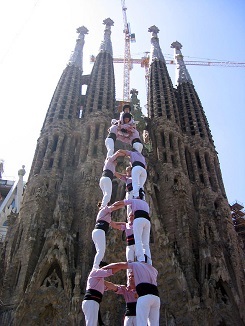 The Barcelona’s castellers have built some 8 levels castell as well as one 9 levels per year. The structure of the castells is made like this: the pinya, the base of the tower, then the foire, second base, the manilles, third base, the tronc, with three people “layers” which allows the tower to be tall and finally, the pom de dalt, the top of the tower. The bases are constituted by adults and their goal is to stabilize the tower, thanks to strength and endurance. They accumulate the weight of the other layers. The tronc is composed of three to nine people, according to the heigh wanted to form the tower. Finally, the pom de tall or the crown of the castle is formed by the youngsters. Children with their agility and lightweight climb to the top of the castell to finish it. Don’t worry, helmet are mandatory for them. The child at the top has to salute the crowd before the second part of the show starts: bringing the structure down. The castell are erected according to certain techniques and bringing it down is also part of the challenge. The group was originally founded in 1969, by people coming from other parts of Catalonia. This has been a challenge throughout the years as in 1985 when a part of the group composed of people form the same village decided to leave to found their own Castellers group. Another issue was to find a new training location. But, the Castellers of Barcelona made their way into the local culture, thanks to the different festivities, like the Mercè and the Festa Major, and to outstanding performances. Indeed, the castellers evolved with time, starting with 4 a pillar 4 structure to 9 storey castles. To discover more about them, you can plannified a visit to the training facilities, to see them in action. The session are usually on tuesdays at 19.30, Thursday at 20.00 and Fridays at 21.00, from February to November, near Clot metro station. To make sure of the location and to be welcomed, contact them at: colla@castellersdebarcelona.cat or by phone at +34 93.498.27.28. Enjoy your immersion into Castellers training or just go and admire them at the Festa Major de Gracia or la Mercè if you come at this time of the year (lucky you!). For a great stay in family, don’t forget to book your room in our family hotel in Gracia.